Our cousin Jamie works very hard to celebrate the Gary Effect in Victoria, British Columbia! So thankful to all the donors for this year’s Sandy Merriman Christmas gifts! 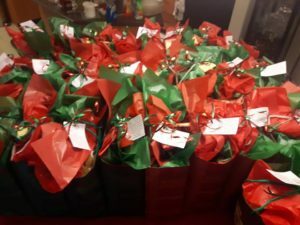 The 25 ladies residing there will each get a bag with 10+ gifts of slippers, toiletries, cosmetics, socks, scarves, jewelry and much more…..along with 3 boxes of clothes, purses and jackets, and big platter of Christmas goodies. 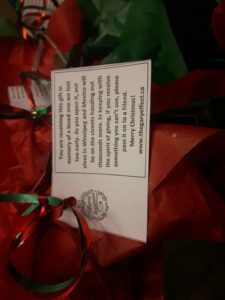 The generosity of Victoria is so lovely.